A brand new range of 30 AA sheet maps utilising the 1:50,000 data supplied by the Ordnance Survey. 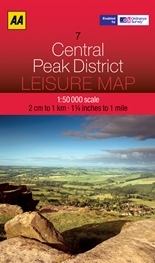 The Leisure series cover the most popular areas of the country, including towns and rural areas. The maps have the familiar look and style of OS mapping, with improved coverage of the featured areas. Aimed at residents and visitors alike they are ideal for planning days out and exploring, helping anyone to get to know an area. A brand new range of 30 AA sheet maps utilising the 1:25,000 data supplied by the Ordnance Survey. The maps have the familiar look and style of OS mapping, with improved coverage of the featured areas. Aimed at outdoor enthusiasts in particular, the level of details ensures nothing gets missed and you won’t get lost.